The Montagu-Ashton Tourism Association has appointed Petrus Jansen as their new Chairman for the 2013/14 year. Petrus is excited about his new challenge and shared the following with us: "Having been involved in tourism in Montagu for the past 5 years, I have directly experienced how important tourism is for our area. Tourism brings people and these people spend money, many invest further. This financial injection is extremely important for our local economy. The money flows through accommodation establishments, local businesses (including our local markets), the municipality and our communities. I'll even go as far to say the money flow attributed to tourism positively impacts almost all members of our community (and I'm talking across all ethnic and income groups). Every now and then a visitor becomes a resident. Residents are the most important asset of our town, they invest their skills and labour. My biggest dream as chairman is for the importance of tourism to be realised by each and every member of our community so that we can all work together and be proud of who we are and what we have. I'm excited knowing that our area is growing and that all will benefit, even our natural environment, if we sustain our growth with wisdom and integrity". 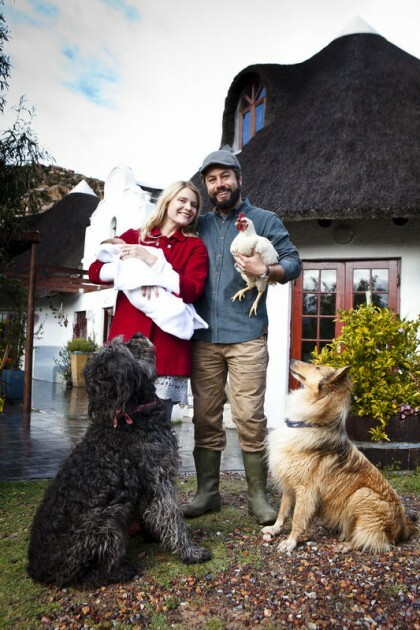 Petrus with his wife Liana, newest addition to the family, son Anno, and just some of their animal friends sharing their farm with them!